FrenchMay Linkable 4ft LED Utility Shop Light allows you to light up your garage in an efficient, cost effective way. It provides you much brighter, cheaper and healthier lighting than traditional fluorescent light could do and lasts up to 22.8 years*. 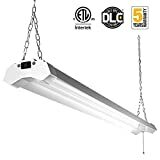 Your existing ceiling light fixture could be easily replaced by this double integrated LED fixture by either hanging mounting or flush mounting. Our ultra light weight design and the included hardware package guarantee you a hassle-free installation.